May 8, 2016, 4:19 PM · Picture yourself in the heart of Amsterdam on a deliciously sunny, long weekend in May. Add an impressive, international throng of bow makers and luthiers. Place the group and their wares in a 17th century jewel of a synagogue and a neighboring early 20th century former bathhouse and you have the makings of a jubilant festival infused with the joy of sharing information and presenting extraordinary instruments. Masterminded by Andy Lim, a Renaissance man whose curiosity and tenacity led from early success as a prize- winning cellist to art and music book publishing with stopovers in architecture and the business of culinary arts along the way, the The Cuvée Darling Exhibition was ambitious in its objectives. 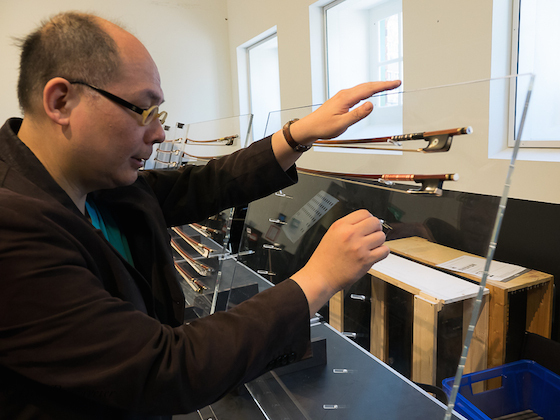 Passionate and knowledgeable in the wide wonderful world of bows and stringed instruments, Lim has hosted festivals in Cremona and Paris in which bows, instruments and their makers took center stage. 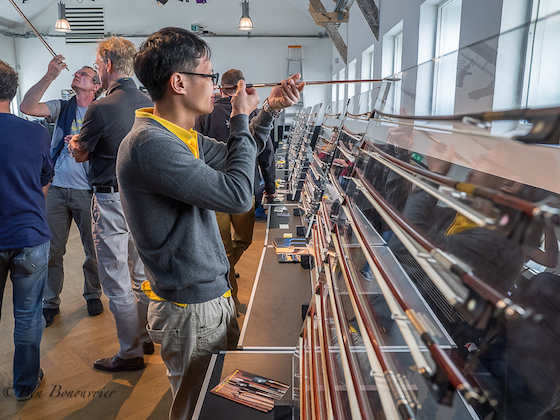 Assisted by the Amsterdam-based bow maker Harm Bakker, Lim welcomed 35 bow makers, 35 luthiers, a guitar maker and lute makers to the happening. Those in the know have discovered that a Lim event is synonymous with improvisation, surprise and copious amounts of fine food and wine. No lectures, no scholarly explanations, no schedule but instead, open doors and the chance to experience a tantalizing array of bows and instruments. Welcome to test drive bows and instruments and indeed, musicians felt like ‘kids in the ultimate candy shop.’ Yet, surprisingly, a lack of publicity led to less crowds than the worthy exhibitors deserved. The artists who make instruments and bows are known for their distinctive camaraderie. In Amsterdam, laughter and jokes in a plethora of languages mixed with healthy critical discussion as renowned colleagues from the bow-making meccas, France and Germany, hailed participants from far-flung climes. The United States was well represented with participants ranging from the prominent Salchow-trained Michael Yeats and David Hawthorne to the West coast Espey-school protégés, Ole Kanestrom, Robert Morrow and the youngest member of America’s bow making elite, Cody Kowalski. In the instrumental new arrival department, the delicate lutes crafted by Daniel Formigoni (Switzerland) and superlative violins by Bruno Rebolledo based in Stuttgart, Germany, and cellos by Camille Dolibeau (Amsterdam) and Anne Grohmann-Fevrier (Moulins, France) deserve mention. Eyebrows rose as several of the ‘workmanship’ judges awarded prizes to one another adding some bewilderment to a new approach to competitions. Bows by Eric Fournier, Emmanuel Begin, Boris Fritsch, Bernie Etsler Mitsuaki Sasano, Luca Slaviero, Josef Gabriel and Cody Kowalski won kudos from the insiders. In a great moment of good-natured high jinx, a wink of the eye and laughter took the last word emphasizing the point that all of the bow makers who participated at Cuvée Darling 2016 were worthy prizewinners. Gold medals were awarded to one and all and the festivities continued on until the wee hours. Fair is fair: to amply demonstrate the incredible selection of bows and instruments on view would take pages of text. And, the links that follow will give the reader a chance to rejoice at least visually. In the foreseeable future, Andy Lim’s website will announce the publication of a catalogue worth its weight in gold.